WASHINGTON, DC - Last week, the US House of Representatives passed three amendments to the National Defense Authorization Act (NDAA) that would provide much-needed transparency into the performance of the Saudi-led coalition in Yemen and potentially end US participation in the civil war. The coalition, to which the US has provided arms, refueling, and targeting assistance without congressional authorization, has created a humanitarian disaster in Yemen. The Yemen Peace Project (YPP) applauds the House’s decision and calls on the Senate to also adopt these three provisions. On Monday, 19 June 2017, the Yemen Peace Project, along with 10 other humanitarian and human rights organizations, released a joint statement commending the UN Security Council presidential statement on Yemen. The statement urges the UNSC to turn their words into action to end Yemen's suffering and find an immediate political solution to the conflict. Next week, the US Senate will vote on Senate Joint Resolution 42, a resolution that blocks the planned sale of precision-guided munitions to Saudi Arabia. Human Rights Watch and the UN Panel of Experts have documented numerous instances of Saudi Arabia targeting civilians in Yemen with US-sold weapons. The Obama administration suspended this sale of precision-guided munitions because of its concerns over Saudi Arabia’s actions in Yemen. S.J.Res 42 seeks to reinstate that suspension. Several organizations and individuals have pledged their support for the resolution, emphasizing the importance of avoiding additional US complicity in a war riddled with violations of international law and promoting the peace process rather than escalating a military campaign that has little chance of success. Below are a number of organizational statements and op-eds making the case for S.J.Res 42. The YPP, along with 40 other national and local organizations, sent the below letter urging Congress to vote in support of S.J.Res.42 to block the pending $510 million arms sale of precision-guided munitions to Saudi Arabia. Recently, bipartisan members of both the Senate and the House of Representatives introduced joint resolutions of disapproval to block the sale of these weapons due to their repeated use against civilians and civilian infrastructure in Yemen. Do your holiday shopping with the YPP! This holiday season, there are several ways you can support the YPP while buying gifts for your friends and loved ones.Do you have a coffee lover on your holiday gift list? If so, we have just the thing for you. Our friends at Al Mokha are offering some very special holiday deals on their outstanding selection of Yemeni coffee. Better yet, between 3pm Monday and 3pm Tuesday (EST) Al Mokha will donate $10-$20 from each bag you buy to the Yemen Peace Project! Give the perfect gift, and help us work for peace in Yemen. What could be better? Shop Al Mokha’s unique coffees--including their limited-availability Al-Ghayoul beans from the mountains of Hajjah--at www.almokha.com. To make sure Al Mokha donates part of the proceeds from your purchase to the YPP, select “Yemen Peace Project” under the “How did you hear about us?” heading on the checkout page. Al Mokha will donate $10 for each 12-ounce bag of Yemeni Medium or Yemeni Dark, and $20 for each bag of Classic or Reserve coffee. Yemen is the birthplace of coffee. The first coffee to be exported to the outside world was shipped from the ancient port of al-Mokha, from which Washington DC-based Al Mokha Coffee takes its name. By selling high-quality, authentic Yemeni coffee, Al Mokha creates sustainable jobs for Yemeni farmers and processors. This holiday season, give a great gift that does some good! If coffee's not your thing, how about some art? We're offering limited-edition prints of selected photographs featured in our 2016 International Yemeni Film & Arts Festival. For each purchase, half of the proceeds go to the artist, and half to the YPP's arts & culture programming. You can also give the gift of peace with a special donation to our advocacy fund! Learn more here. Finally, if you do your shopping on Amazon.com, Amazon will make a donation to the YPP for every purchase you make, at no cost to you! To learn more, visit Amazon Smile today. Thanks for supporting the YPP this holiday season! Dear friends and readers, We don’t often write about American domestic politics, because they aren’t a major focus of the YPP’s work. But Tuesday’s elections in the US have serious repercussions for US policy toward Yemen, so I want to share with you all my own thoughts on the election results, and tell you how the YPP is working to give Yemenis and Yemeni-Americans a voice in Washington. Whether one supports or opposes Donald Trump, it is clear that he lacks experience in foreign affairs, and has little understanding of the issues that affect Yemen and the US-Yemen relationship. Once in office, he will be surrounded by the Republican party’s odd mix of isolationists and interventionists. Trump is likely to appoint someone from his inner circle to the coveted position of Secretary of State; one likely candidate is Newt Gingrich, a disgraced former Congressman who has previously championed the primacy of the Pentagon over the State Department in matters of foreign policy. With little to go on other than Trump’s own statements to date and the past actions of his allies, we have to assume that his administration’s approach to geopolitics will be defined by short-sighted and brutish unilateral action. On the domestic front, things are no better. Mr. Trump has welcomed white supremacists into his tent, empowering those who would discriminate against and attack Muslims and Arab Americans. He has pledged to ban Muslims from immigrating to the US, and to increase arbitrary surveillance of American Muslims. Acts of violence against religious minorities and people of color in this country are all but guaranteed to increase during Trump’s presidency; already, in the two days since the election, two Muslim women in different states have been assaulted by Trump supporters. But I’m not writing to encourage you to be afraid. I’m writing to urge you to act. In the coming year, the Yemen Peace Project will expand our advocacy program to more effectively communicate the concerns and interests of Yemenis, Yemeni-Americans, and international experts to US policy makers. I need you to stand with us in this effort. The YPP is America’s first and only advocacy organization dedicated solely to Yemeni affairs and the US-Yemeni relationship. That puts us in an ideal position to advise and coordinate the work of other organizations, and it allows us to serve as a permanent resource and point of contact for legislators, government officials, and members of the public. Since launching our advocacy program a year and a half ago, we’ve established positive working relationships with several members of Congress, and with staff at the State Department and USAID. Our volunteer advocacy team--led by myself and board member Don Picard--also collaborates regularly with other organizations working on US foreign policy. Through these channels, we are working to end America’s military involvement in the ongoing war in Yemen, and to support the internationally-backed peace process. We have also established an independent working group of governmental, humanitarian, and economic experts to assist with Yemen’s recovery from this catastrophic war. And train new volunteer advocates--in particular Yemeni-American volunteers--to participate in future lobbying campaigns. We know the road ahead will be difficult. We can only make progress with your help. Some of you have already donated to the YPP this year, and I deeply appreciate your support. If you’re able to make an additional gift to our advocacy campaign, or if you haven’t yet made a contribution, I hope you’ll consider doing so today. I look forward to updating you on our successes throughout the year. The Arab Gulf States Institute in Washington hosted a discussion on Wednesday on the nature of U.S.-Saudi relations and the conflicts and challenges that could threaten their close alliance. Heading the discussion was F. Gregory Gause, an AGSIW board member and professor of international affairs. In response to recent friction in U.S.-Saudi relations, and the apparent absence of shared interests and strategic goals, some have predicted that ties between the two countries may soon be broken. Gause, however, says it is unlikely that the U.S. would distance itself from Saudi Arabia, as it remains an important ally in a region that lacks political leadership. Gause explains that the alliance between Saudi Arabia and the U.S. started with the dependence of the Saudi oil industry on American companies and the countries’ shared strategic interests during the Cold War. Today, those interests seem to have disappeared, with Saudi Arabia now controlling its own oil and tackling regional conflicts in a different way than the. U.S.
Gause cites the perception of Iran’s role in the Middle East as the main difference in U.S.-Saudi strategic relations. Saudi Arabia views most conflicts in the region, such as those in Syria, Lebanon, and Yemen, through the lens of Iranian influence, while the U.S. sees these conflicts as stemming from domestic instabilities. In view of these differences, why are both sides working to sustain this relationship? Gause asserts that there are still a significant number of common interests that unite Washington and Riyadh. Both sides see Salafi jihadism as a threat and both have an interest in preventing any other power from dominating the Gulf region and the Middle East as a whole. Gause also questions how the U.S. would go about distancing itself from Saudi Arabia. Unlike countries such as Egypt or Jordan, the U.S. does not provide Saudi Arabia with foreign aid that could be suspended. If arm sales were halted, Saudis could easily purchase them elsewhere, and if the intelligence relationship was cut off, it would only serve to harm American interests. This week hopes to attract well-deserved attention to Yemen's rich history and artifacts by highlighting "their unique beauty, knowledge, and wisdom." If you have the chance, don't miss out on these wonderful exhibits. For the full list of participating museums, click here. [This post was sent to us by a special guest contributor, Fatima Noman. Fatima is 16 years old, and lives in San‘a. This is her third post for the Mafraj Blog.] The thing is when I close my eyes tighter، I hear them louder. Shutting down one sense only clarifies another. The speed of light is a thousand times faster than the speed of sound, the only thing faster than that is the rate at which my heart beats. 9 months later and nothing has changed; my mouth dangles and my eyes widen, enlarge and I taste the end, not of this coalition; but of my life. My life that seems to have been ephemeral and now is burdened be. Looking back on how much I've grown, the only visible difference is how any sound whether cars passing by, motorcycles approaching my neighborhood or one of my siblings slamming the door too fast or strutting harshly in the second floor -or third or fourth-, scares me and makes me tremble to my feet. I've grown accustomed to my realm of vulnerability. They say there have been over ten thousand air raids on Yemen, I've seen every memory of the past 16 years flash before my eyes at least ten thousand times. With every air raid I remember my mother's warm embrace at 6 and my father's loving arms at 8. My sister's advice at 13 and my brother's fights on daily basis. The last time I laughed till my stomach hurt and cried tears of joy. I then remember God and sometimes think; how bad can it be under his arms, it can't possibly be scarier than here? With every unannounced burst of light I regret every fight with my dad and argument with my mom. I remorse every time I discarded my sister and boycotted my brother for his "nuisance". As much as that illuminance of light terrifies me, it reminds me how blessed I was and am and will be. Yes, will be; I won't die. I refuse to die, not in their hands. I will live to be 80 and I will make memories enough to heal all the scars made since the 26th of March. I will heal and I will blossom. Everything seems minuscule and diminutive when compared to death. Your existence, your hopes, your aspirations. You can never really submit to death and accept it, we know it accompanies us wherever we go. Yet we never act like it's tangible we deem it as an "imaginary friend". A friend we only address when we meet face to face. Once we leave its residence, we go back to disregarding it. Whether its a blessing or a curse to become so resilient to death, I'll never know. But for the time being I will dispose the thought of death because I know a burst of light propelled towards me from a jet miles away will not be the death of me. I refuse it to be. And as 2015 comes to an end I have never been happier to end a chapter in my life. 2015 has been by far the hardest year of my life. Looking back at it, I hit so many milestones and I've reached my highest and lowest points all in the course of 365 days. It's crazy how much one year can do. I met some of the greatest, most inspirational people this year, and for that I am eternally grateful. I was privileged to witness a coalition attack my country first hand whilst having no valid reason to attack. I can't wait to have children one day and tell them all about this year, the longest most fruitful and vain year ever. I can't wait to speak about 2015 in past tense. A previous round of talks, held in Geneva in June, collapsed without the two sides even stepping foot in the same room, so the progress achieved in this round, limited though it was, is a good start. Is the international community about to ditch President Hadi? Observers who keep a close eye on Yemeni affairs have understood for a while that President 'Abdu Rabbuh Mansur Hadi, the man touted by most of the international community as the "legitimate" head of the Yemeni state, does not enjoy the full confidence of his government-in-exile. His vice president/prime minister Khaled Bahah seems to command more respect and admiration, inside and outside Yemen, and the government--based between Aden, Riyadh, and Amman--has long been divided between the president and PM, according to knowledgeable sources. But while this intra-regime conflict has simmered behind closed doors, international officials and diplomats have, for the most part, maintained the fiction of the "legitimate" president's control over the "recognized" government of Yemen. * That facade took a few serious hits this week, as both the AFP and Reuters published articles acknowledging the Hadi-Bahah divide. The AFP's Tuesday piece deals with President Hadi's sudden replacement of several ministers and ambassadors. The crux of the maneuver, according to AFP, was Hadi's attempt to replace Foreign Minister Riyadh Yasin, whom Hadi plucked from obscurity to act (quite incompetently) as his chief diplomat back in late March, and whom Bahah has reportedly despised and refused to work with from day one. If Hadi hoped to repair the breach with his VP/PM by ditching Yasin, he seems to have failed: Reuters reported on Wednesday that Bahah had publicly "rejected" the reshuffle, because the president has no constitutional authority to appoint or dismiss cabinet members. Also on Tuesday, Reuters put out a piece that was chock-full of quotes from anonymous Yemeni and foreign diplomats dumping on Hadi, and making it clear that no one in the international community is interested in propping up his presidency any longer than is absolutely necessary. Western and regional officials have voiced support for Hadi's prime minister and vice president, Khaled Bahah, widely seen as a rival, who some describe as a more capable technocrat. "The leadership between Bahah and Hadi is not in sync," the second diplomat said, offering praise for Bahah as a "healer" while describing Hadi as more self-interested. Now, all of that has been conventional wisdom among full-time Yemen watchers for a while now. But when foreign diplomats start saying things like this to the press--especially going so far as to accuse an internationally-backed president of deliberately sabotaging peace talks--it's usually because they've been encouraged to leak by their superiors. While I doubt we'll see figures like John Kerry or UN special Envoy Ismail Ould Cheikh Ahmed publicly disavowing Hadi, it would seem that the powers that legitimized his presidency are now getting ready to facilitate his exit. Stay tuned. *Why all the quotation marks? Here's a quick summary of the precariousness of the Hadi-Bahah regime: Hadi was anointed as president of Yemen under the so-called GCC Initiative, an agreement signed by the ruling General Peoples' Congress coalition and the Joint Meeting Parties opposition bloc that eased long-time dictator 'Ali 'Abdullah Saleh out of power. That agreement stipulated that Hadi would govern for a two-year transitional period, with the help of a power-sharing government split between the GPC and JMP. But Hadi stayed in office far past the two-year mark, with no legal basis. He also reshuffled the cabinet, something neither the constitution nor the GCC Initiative gave him authority to do. In late 2014, after the Houthis began their slow-motion coup with the help of former president Saleh, a new government of ostensibly non-partisan technocrats was formed, with Bahah as PM. But most of that government's ministers resigned in January-February 2015, and President Hadi, after fleeing from Yemen to Saudi Arabia, unilaterally appointed new officials to make up for those who didn't join him in exile. So, when foreign officials or media outlets describe Hadi and/or his government as "legitimate," just know that the term is being applied arbitrarily, and with no legal basis. Yemen’s armed conflict has entered its ninth month with no end in sight: airstrikes and ground fighting across Yemen have thus far claimed the lives of more than 5700 people and pushed the country to the brink of famine, according to activist groups and aid agencies. A new report by Human Rights Watch details the failure of the Saudi-led coalition and its western backers to investigate unlawful airstrikes in Yemen, although “the evidence is everywhere.” The UN special envoy for Yemen, Ismail Ould Cheikh Ahmed, is still pushing for new peace talks in Geneva. On November 25, Prime Minister/Vice President Khaled Bahah met with Ahmed in the Saudi capital, Riyadh. During the meeting, Bahah said that the delegates of his government aim to come back from the new Geneva talks with a solution that guarantees the restoration of peace and security in Yemen. On Monday, President Abdu Rabbuh Mansor Hadi received a draft including notes on the agendas that have been proposed by the UN envoy for the proposed session of talks. UN Secretary General Ban Ki-moon met with PM Bahah on the sidelines of this week’s climate talks in Paris; during the meeting, Ban called on Yemen’s warring parties to return to negotiations immediately and without preconditions. Thus far the Hadi-Bahah government has insisted that the Houthis and their allies must implement UN Security Council resolution 2216 before talks can begin. Over the weekend, airstrikes in the capital, Sanʻa, targeted once again mountainous positions that have repeatedly been struck over the past months. The warplanes also knocked out the road connecting Dhamar, Ibb, and Taʻiz provinces with Sanʻa. It’s been two weeks now since coalition and resistance forces launched a major operation to “liberate” Taʻiz Governorate. Justifications for the delay in liberating Taʻiz and Marib have started to appear in the media; while the field commander in charge says the operation is going according to plan, the local tribal resistance commander stated that 10 brigades of Houthi/Saleh forces are fighting to hold their positions in Taʻiz. Coalition units intensified their efforts to take control of the western part of Taʻiz, near the Red Sea town of Mocha. The western and eastern fronts are reportedly seeing the fiercest clashes since the operation was launched. Pro-Houthi forces are holding their positions in al-Shurayjah and al-Rahidah on the road to the southern province of Lahj despite heavy airstrikes. Likewise, Marib’s western district of Sirwah has not yet been liberated, despite months of fighting. On Sunday, Marib’s deputy governor said that landmines planted by Houthi/Saleh forces are the main reason behind that. Although it has been over a week since the new round of the UN-sponsored peace talks was supposed to be held, the representatives of the warring parties have not yet convened. Meanwhile, airstrikes and fighting continues in seven areas of Yemen—Taʻiz, Marib, Lahj, Shabwah, al-Dhaliʻ, Ibb, and al-Baydha—and outside three Saudi cities near the border. The UN special envoy for Yemen, Ismail Ould Cheikh Ahmed, continues to push for this new session, which is now reportedly expected to take place in Geneva in mid-December. Over the weekend, delegates from the Houthi Movement and the General People's Congress party (GPC) flew once again to the Omani capital, Muscat, after they announced their acceptance of the UN envoy's invitation. On Tuesday, Prime Minister/Vice President Khaled Bahah met with the US ambassador to Yemen, Matthew Tueller, in the Saudi capital, Riyadh. During the meeting he assured Tueller that his government is ready for the peace talks on the condition that the Houthis and their allies are “serious and honest” in implementing UN resolution 2216, which calls for their withdrawal from Sanʻa and other areas pro-Houthi forces have captured. It's been nearly 10 days since the ground offensive was launched to “liberate” the central governorate of Taʻiz: the clashes have been chiefly taking place in the western districts of al-Wazi'iyah, Dhubab and Mowzaʻ, and a few eastern fronts. The pro-Houthi/Saleh forces have retreated from a number of positions there amid heavy airstrikes, but coalition forces and resistance fighters haven’t been able to advance toward Taʻiz city due to landmines planted by Houthi/Saleh forces. Inside the city, rocket bombardments by pro-Houthi/Saleh forces have targeted residential areas as clashes take place in downtown and on the outskirts of Taʻiz. In Marib governorate, the clashes continue to take place in the western district of Sirwah. PM Bahah briefly visited Marib for less than an hour. His visit on Sunday along with a number of ministers was intended as a morale boost for the local resistance fighters. The Houthi/Saleh forces have reportedly gained a mountainous strategic position in Kawfal area and are still holding a number of positions in Sirwah district. Sporadic clashes have also continued to take place in the governorates of Shabwah, al-Dhaliʻ, Ibb, and al-Baydha. In the southeastern province of Hadhramawt, the toll of the first IS-claimed suicide attack on Friday has risen to 18 soldiers and 17 jihadi militants. While the new session of UN-sponsored peace talks in Geneva seems to have been postponed, the airstrikes and ground fighting continued over the past week, mostly in central and southern Yemen and beyond the border with Saudi Arabia. Early Tuesday, President Abdu Rabbuh Mansur Hadi returned to his provisional capital, Aden, one day after Yemeni resistance and Saudi-led coalition forces launched a major operation to "liberate" the central city of Taʻiz. Hadi chaired a meeting focused on the security issues in Aden, where a number of areas are reportedly under the control of jihadi militants. On Sunday, Vice President and Prime Minister Khaled Bahah announced from Suqutra Island the return of his cabinet members to the southern port city of Aden. 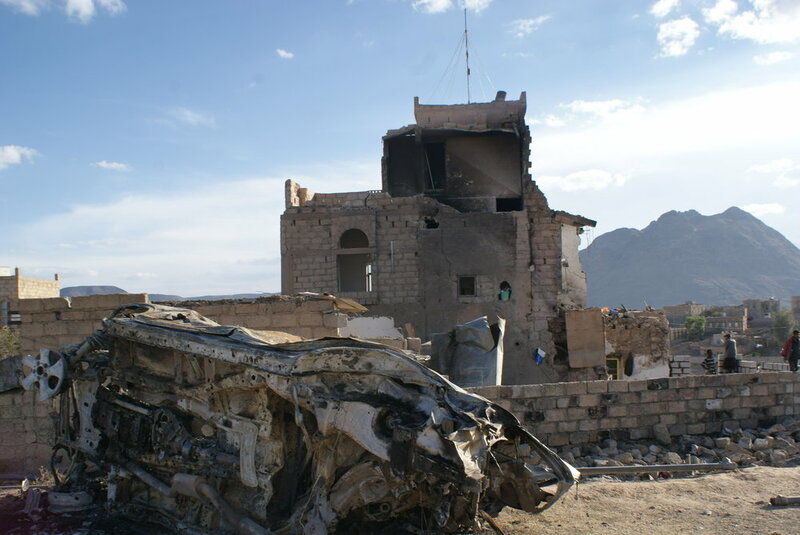 Amid airstrikes by Saudi Arabia and its allies, clashes have been taking place in the central governorates of Taʻiz and Marib as well as the southern governorates of Lahj and Shabwah. In Taʻiz Governorate, fighting has been chiefly raging on the western fronts, near the Red Sea port town of Mokha, in addition to clashes in downtown Taʻiz city, where jihadi militants are believed to be fighting alongside other local resistance factions. Near Mokha town, battles have intensified as the resistance fighters along with Saudi-led coalition forces have gained ground in the al-Waziʻiyah area. However, tens of anti-Houthi forces were reportedly killed in roadside ambush. In Marib, tribal fighters and coalition forces have attempted once again to advance in the western Sirwah district, with air support from fighter jets and Apache helicopters. Meanwhile, Yemeni Army (pro-Hadi) Chief of Staff, Major General Mohammad ʻAli al-Maqdashi, visited the district to oversee the battles there. In Lahj, clashes have taken place near al-Anad military base, one of the most important military installations in the south. Resistance fighters along with coalition forces have reportedly gained a number of positions there. In Shabwah, fierce fighting has been taking place in Bayhan district, which is controlled by pro-Houthi/Saleh forces. In the clashes, Islah Party members have reportedly been killed. With new peace talks fast approaching, the ground fighting continues to escalate rapidly on several fronts across Yemen and across the border with Saudi Arabia, while the Saudi-led coalition’s aircraft continue to provide local anti-Houthi fighters with aerial support and weapons. Ground fighting has been swiftly intensifying in or around six Yemeni cities since early last week, while the new round of UN-sponsored talks aiming to end the conflict in Yemen is just few days away. The new peace-talks session is expected to take place in Geneva on November 15. On Sunday, UN Secretary-General Ban Ki-moon flew to Riyadh to reinforce the push for a peaceful political settlement among the warring parties. Having finalized the initial negations ahead of the upcoming talks in Geneva, delegates from the Houthi Movement and the General People’s Congress party (GPC) returned from Muscat on Friday to brief their leadership in the Yemeni capital, Sanʻa. The exiled government in Riyadh has already assigned five representatives for the new Geneva talks. While the UN special envoy for Yemen appeared to be optimistic, several observers believe the talks are doomed to fail amid the escalated conflict on the ground. In the central city of Taʻiz, clashes are taking place in downtown and intensifying in the eastern frontline, with both sides using heavy artillery and tanks. More than a dozen pro-Houthi/Saleh forces have been killed and wounded in an ambush; civilians have also reportedly been killed. While the pro-Houthi/Saleh forces surround the city from three sides, coalition airstrikes continue to target those forces. More reinforcement troops from the coalition, along with armored vehicles, have reached Taʻiz during the past week. Near the Red Sea port of Mokha, pro-Houthi/Saleh forces claimed to hit a coalition warship, which they say is the fourth to be bombed. In Ibb governorate, pro-Houthi/Saleh forces have taken control of Damt district near Dhaliʻ city, after fierce clashes with local resistance fighters left tens of dead on both sides. Although the coalition’s aircraft provided the resistance fighters with aerial support and weapons, the pro-Houthi/Saleh forces still control large parts of the district. In Marib governorate, clashes erupted on new frontlines in the western districts amid airstrikes and artillery barrages. The local tribal fighters along with coalition forces are poised to capture al-Wakifah valley, some four kilometers outside the western district of Sirwah. In the southern governorate of Lahj, near Aden city, fighting has escalated in what was seen as an attempt by pro-Houthi/Saleh forces to recapture Aden. On the other hand, 200 Sudanese and Gulf troops were reportedly seen leaving Aden, heading toward al-Anad airbase, where at least 400 coalition forces have been stationed. Meanwhile, another Tropical Cyclone, Megh, battered Suqutra Island on Sunday, just days after Cyclone Chapala left at least three people dead and displaced hundreds from their homes on the island. One woman was reportedly killed while four other people were injured by the second storm. In September, several international news outlets reported on a set of letters, written by a member of the Saudi royal family (known in Arabic as Al Saud, the House of Saud), calling on the entire family to overthrow King Salman, Crown Prince Mohammed bin Nayef, and Deputy Crown Prince Mohammed bin Salman. None of these outlets, however, has published an English translation of the letters. We're doing so here for the first time. These letters deal only briefly with the war in Yemen, but the war--and the larger trend of military adventurism--is one of the author's major grievances with the Salman regime. You can download the full English text of the letters here. Below are some choice excerpts, followed by commentary on the letters by journalist and Chatham House Fellow Peter Salisbury. The peace and compassion and blessings of God be upon you. All praise to God, Lord of the universe, and God’s peace and blessings be upon His most noble messenger. The Founder brought us up on a set of principles that maintain authority, strengthen the state, and keep a balance in the country between the ruler and the ruled. We learned from him that maintaining authority requires that power should be held only by the oldest and most suitable, and that they should make the others share in their decision-making; that the character of the state should remain Islamic and pure; not to compromise the application of Sharia; to respect religious scholars and preserve their role in society; and to value notables. The late Founder also taught us not to mix authority with business, to take our share of public money formally and not stretch out our hands in cheating, deception or fraud, what is now known as corruption and embezzlement. We also learned from him to adhere to good morals and religious correctness, and when plagued with something, not to shout about it, or be defiant. We learned to give people their value, to behave modestly in the majlis, and to accept advice; not to turn down a petitioner, not to close the door, not to reject those who ask, not to let down the oppressed, not to help the oppressor. How for example did we accept that the sons of Abdulaziz should be marginalised both in power and in participation in decision-making? How did we accept, passively and without intervening, the King’s mental condition which renders him unqualified to continue in authority? How did we accept that a person close to the King should dominate the country politically and economically, and leave him to make plans at his will? Thirteen sons of King Abdulziz are still alive, and between them they possess great competence and experience, particularly Princes Talal bin Abdulaziz, Turki bin Abdulaziz and Ahmed bin Abdulaziz with their great ability and well-known political and administrative experience which should be harnessed in the interest of religion, the Holy Places, and the people. I asked journalist and Chatham House Fellow Peter Salisbury a few questions to help us gauge the importance of these letters in the context of internal Saudi politics. YPP: How much importance should we ascribe to these letters? Assuming the author isn't capable of pulling off an actual coup, what, if any, change can other members of the royal family hope to achieve? Salisbury: The surprise with these letters isn’t that they have appeared; it’s that it has taken so long for them to do so. When King Salman appointed two members of his Sudairi branch of the family, his nephew Mohammed bin Nayef and his favourite son Mohammed bin Salman, who may have been as young as 29 at the time, as first and second in line to the throne, it sent shock waves across the Saud family [Will's note: "Sudairi" refers to the descendants of King Abdulaziz and Hussa bint Ahmad al-Sudairi, including the so-called "Sudairi Seven," the most powerful grouping of Abdulaziz's many sons]. At the time, a lot of reports on the appointments focused on generational change - it was the first time in Saudi Arabia’s modern history that one of Abdulaziz al-Saud’s grandchildren rather than sons had been made crown prince - and on the youth of his son after years of septuagenarian crown princes. But the bigger issue for the Al Saud was that King Salman had concentrated current and future power in the Kingdom in the hands of one branch of the family. Some analysts described the move as being, in effect, a palace coup, with the King also setting his son up as future monarch. The author of the letter is fairly clear on this point: “How… did we accept that the sons of Abdulaziz should be marginalised both in power and in participation in decision-making?” he writes. So the rest of the family - the descendants of Abdulaziz’s other sons - were unsurprisingly unhappy. But the King's war in Yemen and the young Prince became very popular in the early months of King Salman’s reign, thanks in no small part to glowing domestic media coverage. It would have been very risky indeed to publicly criticize King Salman or the Mohammeds. Eight months in to King Salman’s reign, it looks like the author of the letter has exhausted internal channels for expressing his frustrations and has turned to the Western media, which has by and large been very critical of the war in Yemen and tends to be pretty critical of the House of Saud and the West’s relationship with the regime. That makes the letter feel a bit like a desperate last attempt to get King Salman to reverse course on the succession issue, by someone trying to carve out a political space for themselves. It’s interesting to see this happen, and critics of the Saudi regime will of course latch on to it but I am not sure what impact if any it will have on the actual internal workings of the state, especially given that the concentration of power within the Sudairi family is continuing apace (the author talks about mixing ‘authority with business’ which is a pretty clear attack on the deputy crown prince - a lot of the letter is an attack on hism - who has taken a big role in managing the economy, took over the lucrative position of head of the Royal Court, and has been accused of redirecting a lot of business and patronage to his own inner circle, which is in reality fairly standard practice when a new King takes over). I could be wrong of course, but this isn’t actually the first time something like this has happened and in general the impact has been pretty limited. The author seems to recognize this: “[T]ime goes by quickly, and each day that passes makes it more difficult to grip the matter than the day before”, he wrote in September, and two months on we haven’t seen any movement. YPP: In addition to King Salman, the letters call out Mohammed bin Salman and Mohammed bin Nayef in particular. Is it accurate to view the two Mohammeds as allies/partners, or do they each have different agendas? In other words, would Mohammed bin Salman be likely to retain his current position of power in the event of Salman's death? Salisbury: First, a disclaimer: a lot of analysis of the inner working of the House of Saud tends to devolve into Kremlinology - people trying to derive meaning from what little information emerges from inside the Palace (well, the Palaces but you get what I mean). So what I am providing here is my best educated guess. As far as the two Mohammeds - MbN and MbS, as they are known - are concerned, it’s worth remembering that MbN was a widely acclaimed figure in the Saudi media in the past and that he has been seen as the US’ favorite Prince since the turn of the millennium thanks to his role in taking on Al Qaeda inside the Kingdom. Now we’re seeing him being eclipsed in media terms by MbS and it is difficult to know if that's a choice and he’s taking a knee, staying out of the limelight, and if so why - because he isn’t happy with the Yemen war (as many suggest)? - or because he doesn’t have much of a choice; or as some people suggest because he is happy to give his young cousin enough rope to hang himself with. But either way, MbS has become incredibly visible in the Saudi press while MbN is a much quieter figure these days. Nevertheless MbN is in a strong position to become a very popular King: he’s young enough to have a few decades on the throne and if he succeeds Salman will be the first of his generation to become King. He is likely to be wary of MbS, who is in the process of gathering an awful lot of power around himself with respect to not just the military but also the economy. So theoretically it might make sense for MbN to do what King Salman did and completely change the line of succession. But they are from the same branch of the family, and I suspect that the Sudairis as a unit will be keen for the two Mohammeds to remain on friendly terms to ensure that power is concentrated within the family for the foreseeable future. A lot, of course, depends on how long of a reign King Salman has, how various aspects of current foreign policy play out, and how the oil price and economy fare in the next five years or so. YPP: What other important groupings or factions exist within the royal family, and how might their priorities differ from the current ruling faction? Salisbury: Basically, the other factions are the remaining sons of Abdulaziz and the sons of his children, particularly the offspring of former Kings and senior Princes, who are worried that their branches of the family may be robbed of their inheritance - i.e. a fair shot at the throne in the future. Abdulaziz had an estimated 45 sons and a similar number of daughters so being a Saudi Prince is a bit like like having the surname Smith in the UK or US. The author of the letter mentions a number of the most prominent former Kings and Princes - Saud, Faisal, Khaled, Fahd, Nayef - while taking a swipe at the previous King, Abdullah, and at Salman so I think it’s fair to guess he isn’t from either of these branches of the family. It’s also interesting that he refers to the 13 living sons of Abdulaziz and puts forward a list of potential candidates for King who are fairly low-key and would likely not overstep the mark when it comes to marginalising the rest of the family. The issue for the rest of the al-Saud is that if the Sudairis become the only branch of the family who are considered for succession, everyone else will become increasingly removed from the levers of the state and hence prime opportunities to receive and distribute patronage. That means their influence and power will be eroded, and that their ability to angle for future posts or crown prince roles will also be limited. So the issue really is one of being marginalized in the long term, and of a power-grab by a single branch of the family, which in and of itself is seen by many Princes as breaking the rules.